Blindly in love coffee and date are known as a pair made in heaven. When you bind them together in a cake the marriage is called coffee date cake. In today’s recipe, I have used the lovebirds, put them in a cake, but with a healthy twist. Between me and my wife, there is a never-ending conflict between tea and coffee. I am for tea and she is for coffee. But this coffee date cake brings the never-ending conflict between us. I can now sip a cuppa of ginger tea while biting this extraordinary delicious coffee date cake. 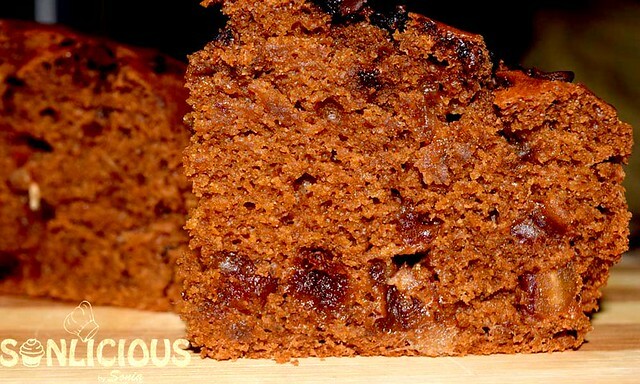 The recipe uses whole wheat and dates and both of these ingredients makes this cake an extremely healthy cake. I have written a complete article on the benefits of dates and I recommend reading it. My love for dates is never-ending. I added coffee decoction to blend the rich taste of coffee in this eggless date cake with wheat flour. A coffee decoction is a liquid we get after straining boiled coffee grounds. In general, people us a coffee filter to prepare this decoction. But in case you don’t have a coffee filter, there is nothing to worry. You can prepare it without using any coffee filter. 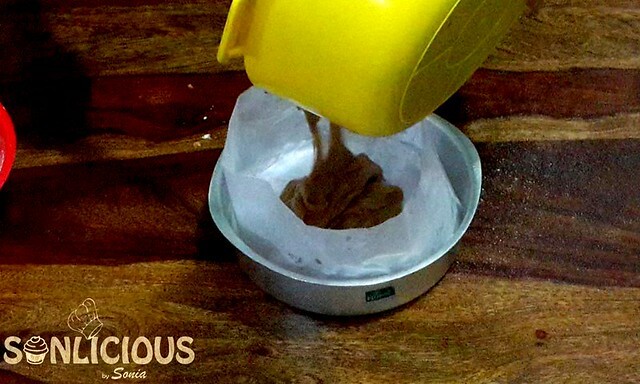 Continue to read to learn how to prepare coffee decoction without a coffee filter. In a pan take 3/4 cup (approximately 180 ml) water. Boil it. Add 3 tablespoons of grounded coffee powder. Boil it for 2 minutes. Cover it with lid and turn off the flame. Let it rest for 10 minutes. Cover a bowl with a clean muslin cloth. Pour the prepared solution over the muslin cloth and let it strain through it. Once you get the strained solution in a bowl, discard the residuals left on the muslin cloth. 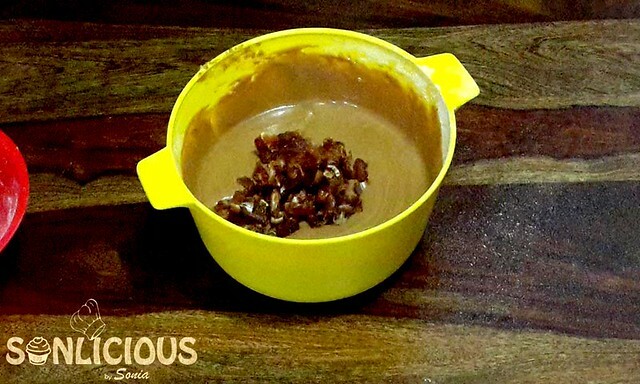 The coffee decoction is ready for your eggless dates cake recipe. In a bowl add oil, brown sugar, milk, coffee decoction, and vanilla essence. Mix it until sugar dissolves. I preferred organic brown sugar over refined white sugar. The brown sugar is relatively healthier than regular white sugar. It also helps in enhancing the color of the cake. With the help of a sieve, sift the whole wheat flour, baking soda, baking powder, and salt together. Sifting not only helps to remove the unwanted particles but also aerates the dry ingredients. It helps to raise the cake and makes it spongy. Gently fold all the dry ingredients into wet ingredients. Add chopped dates and mix them into the batter. There should be no lumps in the batter. The batter should be smooth and of pouring consistency. Meanwhile, keep the oven for preheating at 180 °C for about 10 minutes. Once the batter is ready, pour the batter into a baking tin (line it with parchment paper). In the absence of parchment paper, you can brush the baking tin with butter and sprinkle some dry flour. This will help to de-mould the cake easily. Pour the batter into a baking tin and tab it on the counter to release the air bubbles. 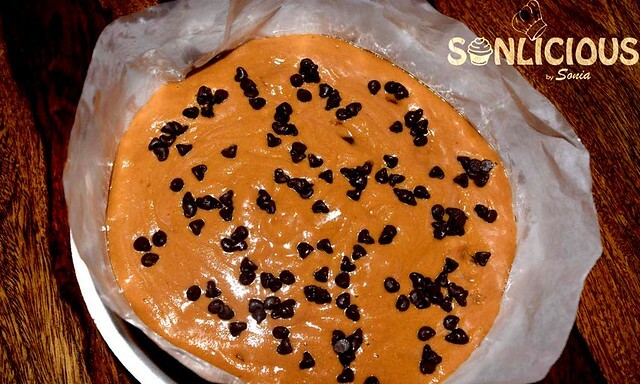 Sprinkle some chocolate chips and put this baking tin into the oven. Let is bake at 180 °C for 30 minutes or until it passes the toothpick test. After baking for 30 minutes, take out the cake from oven and let it rest for 5 minutes. Now, de-mold the cake and keep it on a wire rack. Once the cake comes to room temperature, cut it and serve it. Many people think that cakes with whole wheat are generally dense and not as spongy as cakes with all purpose flour. Bake this cake, you will stop using all purpose flour for your cakes. 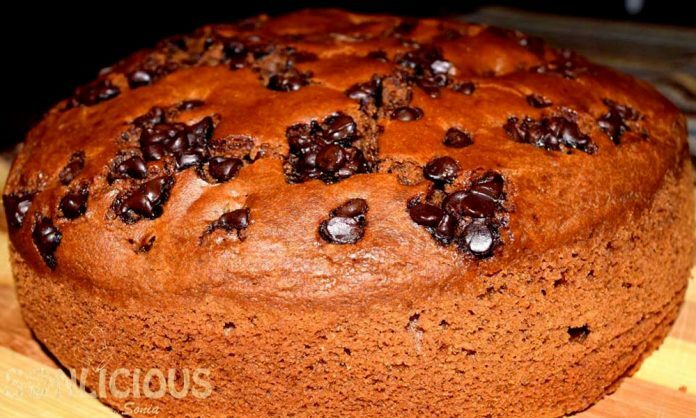 This cake is eggless, extremely moist, spongy, healthy and full of flavors. This Coffee date cake with whole wheat is a heavenly treat for coffee lovers. Don’t miss to try this recipe. If you like the recipe then share your love with me by subscribing to my YouTube channel. Make Eggless Coffee Date Cake Recipe with Whole Wheat. The recipe produces a soft and moist date cake recipe. This easy coffee cake recipe with dates is a perfect blend of health and taste. In a bowl add Oil, Brown sugar, Milk, Coffee decoction and Vanilla essence. Mix it until sugar dissolves. 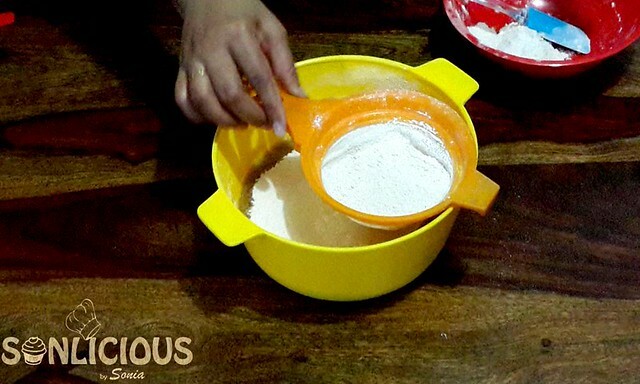 With the help of a sieve, sift the Whole wheat flour, Baking soda, Baking powder and Salt altogether. Gently fold all the dry ingredients into wet ingredients. Add chopped dates and mix them. Meanwhile, Put the Oven for preheating at 180 °C for about 10 minutes. Pour the batter into a baking tin and tab it on counter to release the air bubbles. Sprinkle some chocolate chips. Bake at 180 °C for 30 minutes or until it passes the toothpick test. After baking for 30 minutes, take out the cake from oven. Once cake comes to room temperature, de-mould it. Cut it and serve it. This Coffee and date cake with whole wheat is a heavenly treat for coffee lovers. In case you don’t have grounded coffee to prepare coffee decoction, then use 3 tablespoons of Instant coffee powder. You can use white sugar instead of brown sugar. Prefer to use fresh brewed coffee to have rich flavor of coffee in the cake. If you prefer using eggs, skip milk and use 2 large size eggs. Hi Soniya I made this cake today with instant coffee powder. But the batter turned out extremely thick, dough like consistency. I almost poured 200 ml more milk to make beatable. What could be the reason ?? Quality of whole wheat flour ?? I use Lokwan wheat flour which is not defined. Also the cake bakes in 20 mins and it’s quite dry. How much flour did you use? The batter for cake should be of pourable consistency. If it was not then the cake will be dry and hard. Adjust the amount of liquid accordingly. Hi Sonia …thanks for this cake recipe..just baked it. .looks good and smells divine ..I used wheat flour ..eggs ..topped with walnuts and chocochip ..
Soaked the dates in hot coffee concoction …I doubled all ingredients ….as I wanted a bigger cake …color is a lovely dark honey …thankssssss a lot for sharing such a wonderful recipe. .. Thanks for such lovely feedback and experimenting further on the recipe. How about posting a pic of your cake on instagram and tagging me there @bakewithsonia. I would love to see your bake. Does the proportion vary if I want to use all purpose flour instead of whole wheat? Yes, the recipe will need to be adjusted on other ingredients too if you replace the flour. Thank you so much for the perfect receipe. I tried it and came out excellent, we all loved it. Cake was very light and spongy. How to replace coffee decoction with chocolate? Please guide with the proportion and process. Thanks! Instead of thinking of replacing coffee decoction with chocolate, I recommend searching for Chocolate Cake on my blog and try those recipes. Your recipe says instead of milk we can use 2eggs. And do we beat it with the whipper or just hand mix it. Vinita, here 2 eggs means complete eggs ( including yolk). Whisk egg and sugar first, then follow the rest of the procedure. You can use regular hand whisker or electric whisker. First of all thanks for the detailed recipe,Just want to know what would be the weight of the cake. It should be around 700 to 800 gm. what is the pan size(round shape)? Hello Pratyusha, it is an 8″ Pan. Hi, I’ve tried the cake twice. It’s so delicious!! Once I made as is, second time I added some walnuts and reduced the number of dates. While chopping the cake, it gets crumbly..,what could be the reason ? How to improve? The cake is very soft and delicious. If the cake comes out soft then it cannot be crumbly. Let me ask if the size of the walnuts you added were big. If they were big, while slicing the cake it will crumble around the area of walnut. You need to finely chop the walnut if you like to use in the cake. If I use instant coffee pdr,then also do I need to prepare concoction n how,what is d measurements for water. I have mentioned the combination with instant coffee powder also in the recipe. How about taking a minute and reading the recipe completely. In case you will have more doubts which are not answered in the recipe, I will be glad to help you with. Hi. I tried the recipe today. The texture is very nice. But even though I used the filter coffee decoction, there is no flavour of coffee. Doesn feel it has coffee at all. Can’t understand why. First check should be the quality of coffee. Next time try with instant coffee powder. I used Bru Gold filter coffee and the cake tasted awesome. Thanks for writing. In order to make muffins, first you need to reduce the amount of milk into this. 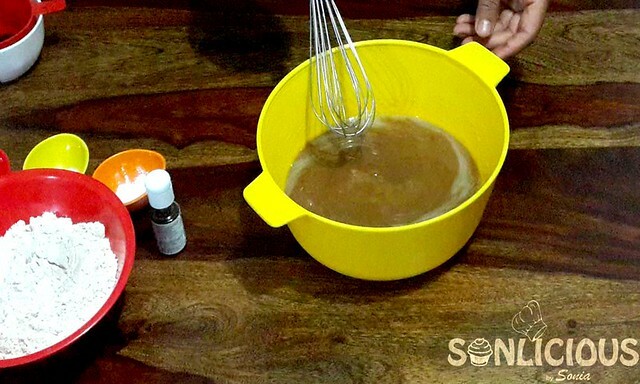 instead of using 250ml add only 200ml of milk while making the batter. These ingredients should be good for 12 -15 medium size muffins. We need to reduce the milk content to ensure that muffin is not under-cooked during the baking process. Can you please provide whole wheat flour and sugar in cups measurements? Please use the following conversion chart to check grams into cups. I have used a 8″ tin to bake this cake. I tried this cake. it tastes really yum. But the choco chips has been melted while baking. how to retain that?? The quality of Choco chips matters a lot. 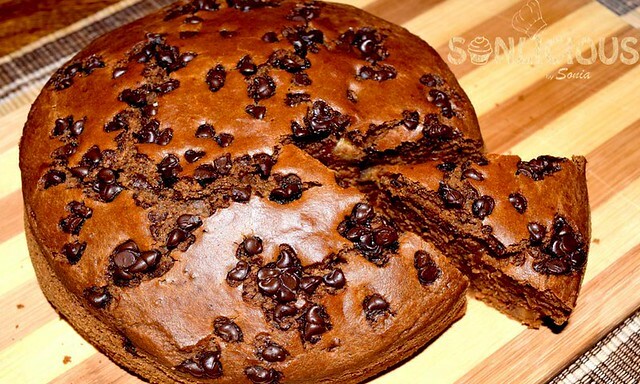 Try finding superior quality of choco chips that will sustain during the baking process. 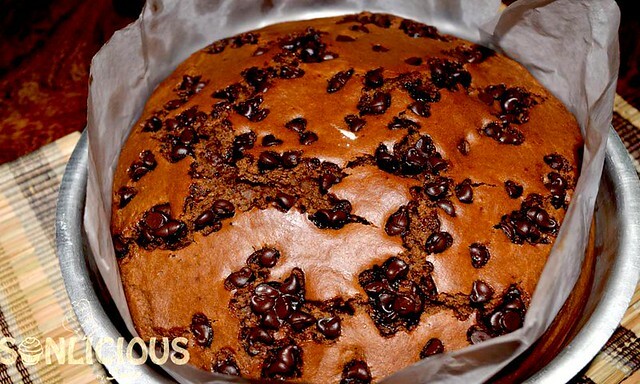 Keeping your choco chips in freezer also improves their melting time during the baking process. Hope this helps. Thanks for sharing this easy and yummy recipe. Do I need to change any proportions is I omit dates? Sugar should be more? The dates i have used for the recipe are not sugar quoted. So even if you don’t add dates, no need to make any other alterations to the recipe. Looks like you have missed reading the tips. I have mentioned details in the recipe. This sounds so good! The combination of coffee and dates- mmm! Very interested to try since it’s eggless too…. I hardly ever bake that way so I am up for something different! Absolutely Collette. I am sure you will love the taste as well. It is so easy a recipe and I will recommend you to give it a shot. Hi dear, I tried the receipe to the T..bt my batter was nt of pouring consistency.. I added lilltle more milk to it.. The cake baked is soft but flavor of coffee was very light.. Culnt say there was coffee added to it…is it same fr u or u used some strong coffee.. I used nescafe classic..
Hello Prachi, We have used coffee decoction that has stronger flavour to instant coffee. However in the recipe I have mentioned that you should be using 3 tbs of instant coffee if you like to make the cake with instant coffee. What’s the substitute for coffee decoction in case I replace with some other flavour? You can use chocolate against coffee decoction.